The Blaser Emergency Alert Messaging System is the only system that permits this functionality. The Blaser Emergency Alert Messaging System displays a large, noticeable, flashing, attention-getting message even if no one is logged on! The Blaser Emergency Alert Messaging System can be used in the event of a disaster to alert every computer on the campus, whether a user is logged in or not. 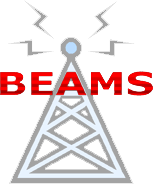 The BEAMS client established a connection to the BEAMS server and runs in the background, listening for your emergency broadcasts to alert of emergencies like tornadoes, hurricanes, chemical spills, terrorist attacks, earthquakes, tsunamis, etc. The BEAMS client can be configured with five different distinct alert levels which display the alert message, flash alert graphics and emit a loud alert sound. The system also has the capability of a silent test-mode (to test client connectivity) and Balloon Popup notification (for non-emergency alerts). The Blaser Emergency Alert Messaging System is the perfect way to relay specific information to students, employees and anyone else during an emergency in your organization. Tell people what to do immediately! Don’t rely on e-mail notifications; get the alert out to everyone now with The Blaser Emergency Alert Messaging System.